On 21 September, Mary Robinson reflected on the life and legacy of Kofi Annan, during an address to the UN General Assembly in New York. "I am reminded of something Kofi would often affirm: that there is no peace without development, no development without peace, and neither peace nor development without human rights." I am honoured to speak here today about Kofi Annan, who was first my boss as Secretary General, and later we were Elders, brought together in July 2007 by Nelson Mandela. When I took up my appointment as UN High Commissioner for Human Rights in September 1997, my staff in Geneva told me the exciting news that Kofi Annan had put through a UN reform package in July 1997, which provided for executive committees on Peace, Security, Humanitarian and Development issues, and that the office of High Commissioner was the only one to be a member of all four executive committees. When I came to the General Assembly later that September, and met my new boss again, I asked what he had in mind in having human rights at the table in all four executive committees. With a lovely smile, Kofi said, ‘That’s for you to work out Mary’! During the five years I served in the post, I knew I had a Secretary General who was committed to linking peace, development and human rights. Yes, there were times of some tensions. The role of High Commissioner for Human Rights is to speak truth to power and to represent the first three words of the UN charter – ‘We the Peoples’. The role of Secretary General is a more complex, diplomatic one of essentially navigating the way forward through advocacy and persuasion. 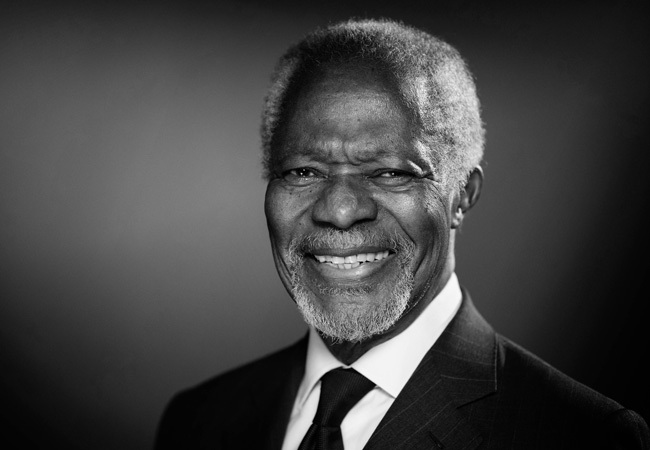 During this period Kofi led the UN through some of the most difficult times in its history – Rwanda, Srebrenica, the Gulf War and 9/11. It was a time when the organization’s continued relevance was being openly challenged, as the new millennium dawned. This must have been such a huge professional burden, such a formidable task, with tremendous personal pressure. 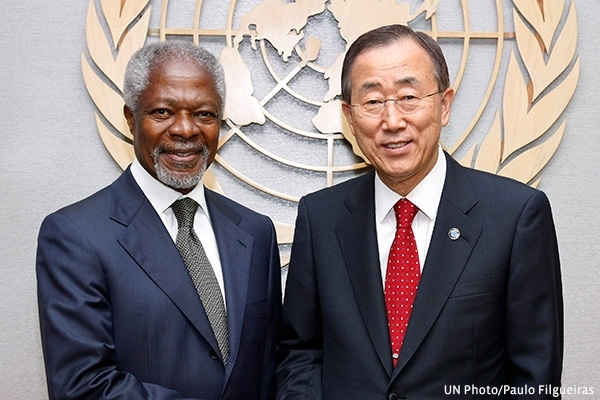 And yet – Kofi steered the UN through this period with assured calmness, grace and dignity. He left the organization with a sense of purpose, a vision and a mission that it was struggling to define or defend when he arrived. 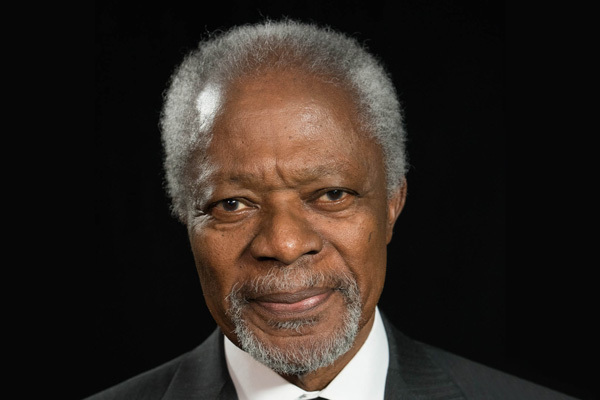 Kofi’s determination re-established the UN as a body to defend the poor and vulnerable, to provide support to those suffering injustice, and to be the custodian of equality and human rights. He lifted the United Nations into the 21st Century and gave it relevance and immediacy in a world facing new challenges of inequality, injustice and, of course, climate change. None of this would have been possible without his courage, without his powers of persuasion, without his optimism for the idea that, when we work together, we can achieve great things. Kofi spent his whole life believing change is possible. He witnessed it in Ghana as a teenager when his home country gained independence, and he saw it time and time again in his 44 year career within the UN. In situations where settling for opposition was easier than seeking agreement; where intransigence trumped co-operation; where political inertia beat political will – Kofi would remain stubbornly optimistic that a way forward could be found. And he was right many more times than he was not. He believed passionately in the United Nations and its role in defending and progressing human rights. He always referred to the UN as a family. He nurtured it like a family. He stood up for it like a proud father. He cared for its wellbeing and its future as a loving parent would. After his time at the UN he established the Kofi Annan Foundation to continue his work, and we joined the Elders at its founding in 2007. Kofi saw our role as Elders as an extension of his work on the issues closest to his heart – peace, justice and human rights. He became our Chair in succession to Archbishop Desmond Tutu, and he too, had a great sense of humour. When I served as envoy of the Secretary General for the Great Lakes and the Democratic Republic of Congo, I rang my husband Nick in our home on a lake in the West of Ireland from Kinshasa. He explained that he was trying to sort out a local row and said ‘Think of me as the special envoy of the small lakes’! When I told Kofi this he burst out laughing, and ever afterwards he would greet Nick as the special envoy of the small lakes! Mary Robinson and Kofi Annan in Zimbabwe in July 2018. Kofi was working tirelessly right up to the end. I joined him on an Elders visit to Zimbabwe, just before the country’s recent elections, on what would be his last public engagement. He was not feeling well but had a sense of the importance of a peaceful outcome for the people of Zimbabwe. He pushed himself hard, and became ill on the flight back to Switzerland. His death shortly afterwards was a great shock to his beloved wife, Nane, and their family, to his Foundation, to The Elders, to the UN system and to the many, many friends and people he influenced around the world. As we reflect here today on his legacy, and the millions of lives he touched, I am reminded of something Kofi would often affirm: that there is no peace without development, no development without peace, and neither peace nor development without human rights. He believed that this was what the UN existed to achieve, and through his quiet power of persuasion and stubborn optimism, it is what he has inspired many of us to dedicate our lives to. I, along with the entire world, will forever be indebted to him for that. First woman President of Ireland and former UN High Commissioner for Human Rights; Chair of The Elders; a passionate, forceful advocate for gender equality, women’s participation in peace-building and human dignity. On 21 September, Ban Ki-moon reflected on the life and legacy of Kofi Annan, his predecessor at the United Nations, during an address to the UN General Assembly in New York. Kofi Annan's passing stunned the world. Here, we compile a selection of tributes from his friends, colleagues and those inspired by his leadership.